By putting straw bales along the edge of a river, you can identify the places where inanga are spawning and make these sites a priority to restore with native planting. 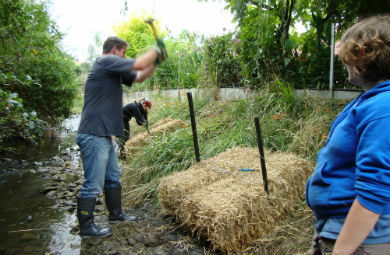 Straw bales also provide temporary spawning habitat in places where the natural habitat has been damaged or destroyed. This can help to reduce the decline in inanga populations. Using straw bales in a river or stream is a practical way for families, children and community groups to learn more about inanga and their lifecycle. Download our guide to use straw bales to find the places where inanga spawn in your area. This guide has information about when, where and how to put straw bales along a stream or riverbank and how to spot the inanga eggs that are laid on them. Read about inanga, suitable habitat and spawning sites online (see links below). Find out about the streams and rivers near you that may be good places for inanga to spawn. Your local regional council or council may be able to provide information. Search iNaturalist NZ – Mātaki Taiao and Our Estuaries to find any estuary, iwi and environmental care groups that are already working in your area. Check if the land beside the stream or river is privately or publicly owned and ask for permission to access to the site and to use straw bales e.g. this may require a consent from the regional council. If you have to cross private land to get there, ask for permission from that land owner also. Do not go onto private land without permission. You may need to look at several streams or rivers before you find a good place to put the straw bales. Keeping yourself and everyone in your group safe is very important. If you’re working around rivers and streams, wear appropriate clothes and check the weather forecast and tide times. Some streams and rivers have steep banks and water levels can rise and fall rapidly, especially after rain. Avoid these places and check everyone in your group has enough fitness to do the work safely. It’s also important to remove the straw bales at the beginning of winter (after all the eggs have hatched) so they don’t cause flooding in the waterway. A University of Canterbury study in 2009 tested straw bales, straw tubes and moss tubes to see if they would be suitable as temporary places where inanga could spawn. The study found that all three artificial habitats held a greater number of inanga eggs than the grass habitat nearby. More eggs survived in the straw bales, and straw bales were also found to be the easiest artificial habitat to use. Straw bales were also used to find out where inanga were spawning after their habitats in Christchurch were damaged by the Canterbury earthquakes. The straw bales were placed along the river edges to find out how far upstream and downstream spawning occurred and if fish were spawning in between the known spawning sites. Spatial effects of the Canterbury earthquakes on inanga spawning habitat and implications for waterways management.